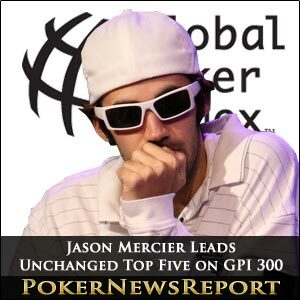 Team PokerStars Pro Jason Mercier continues to lead the way on the Global Poker Index (GPI). The 25-year-old star remains in the number one position on 3,014.34 points, ahead of fellow American Erik Seidel and Frenchman Bertrand ‘ElkY’ Grospellier, after losing just 0.74 points from last week. Bellagio in Las Vegas last month – can expect to remain atop the summit for the next few weeks, at least, although results from the PokerStars Caribbean Adventure will surely see some big changes further down the rankings. Mercier finished third in the PCA $5,000 buy-in No-Limit Hold’em 8-Max event for $80,460, so will increase his lead in the next rankings list. For now, though, the top five places on the GPI 300 remain unchanged, with Mercier, eight-time World Series of Poker (WSOP) bracelet winner and Vegas native Seidel (2,851.80) and Triple Crown winner Grospellier (2,829.10) followed by Ukrainian Eugene Katchalov (2,749.99) and English Titan Poker Team member Sam Trickett (2,582.47) in places four and five respectively. Former Team Full Tilt Pro Seidel has not gained – or dropped – any points from his previous score, while Team PokerStars Pro Grospellier has closed the gap on the American to just 22.7 points by upping his total by 23.35.
stop at the Palm Beach Casino in Cannes for $1,364,666 – to 167.52 points from the previous gap of 73.86. There was, however, some notable movement in the top 10, with Canadian Shawn Buchanan leaping two places to sit in sixth on 2,430.85, despite seeing no change in his points, while Brooklyn’s Vanessa Selbst (2,412.31) – who is a Team PokerStars Pro – and New York State’s Will ‘The Thrill’ Failla (2,359.99) dropped one and two places respectively to stand at seventh and ninth. Florida’s Matt Waxman moved up one spot to eighth on 2,395.23, but the most interesting development saw Vegas-based Sam Stein (2,248.98) – the European Poker Tour (EPT) San Remo €10,000 buy-in No-Limit Hold’em 8-Max champion from October – jump three places to break into the top 10. Poker fans should watch out, however, for significant movement further down the rankings after Arizona-based stock trader John Dibella emerged victorious from the $10,000 buy-in main event at the PCA for $1,775,000 at the Paradise Island’s Atlantis Resort and Casino. San Jose’s Faraz Jaka, who finished third for $755,000 in the above event, will surely climb back into the top 300 after falling out on the latest update, while the 18th place secured by Ohio’s Byron Kaverman (1547.27) ought to see him move up from his current position of 91st on the GPI. Additionally, with Ukrainian Leonid Bilokur collecting $1,134,930 for taking down the PCA $25,000 buy-in High Roller event, expect to see him increase his points total, too, as will Jonathan Duhamel – who has enjoyed a fantastic trip to the Caribbean. The Canadian Team PokerStars Pro has already won the $5,000 buy-in No-Limit Hold’em 8-Max event for $239,830, while also recording a runner-up spot in the $25,000 buy-in No-Limit Hold’em 8-Max High Roller for $634,550, a fourth place finish in the $100,000 buy-in No-Limit Hold’em Super High Roller for $313,600, and fifth spot in the $5,000 No-Limit Hold’em 8-Max Turbo for $17,990. That’s an incredible $1,205,970 earned by the 24-year-old in just over a week – and is particularly astounding considering he was so badly beaten just before Christmas when his Quebec home was broken into by robbers, including former girlfriend Bianca Rojas-Latraverse. Duhamel currently sits in 52nd place in the rankings – up 30 spots – but will add numerous points to his total of 1735.55. WSOP main event champion Pius Heinz, of Germany, finished fifth in the $5,000 No-Limit Hold’em 8-Max event at the PCA for $45,980, so will undoubtedly return to the top 300 after dropping out of the latest list now that his November Nine success (which is included on the July set of results) has dropped into Period 2. There are 10 new names on the latest GPI list, with Pennsylvania’s Dan Shak leading the way in 267th place on 1,069.61 points after he finished as runner-up to Swedish online poker specialist and Team PokerStars Pro member Viktor ‘Isildur1’ Blom in the PCA $100,000 buy-in Super High Roller event. Paul Berende (1,045.97 points) – who regularly plays at PokerStars – has entered the top 300 in 280th place, while the other newcomers are Nicolas Cardyn (281st place on 1,043.57 points), Jan Bendik (285th on 1,036.43), Nikolay Evdakov (289th on 1,028.35), Amnon Filippi (290th on 1,024.99), Ognjen Sekularac (291st on 1,024.48), Greg Brooks (293rd on 1,021.03), Ville Haavisto (294th on 1,019.61) and Team Victory Pro Andrew Robl (298th on 1,008.74). As we all know, with 10 new names on the list, that must mean the same number dropping out – and they are Team PokerStars Pro Heinz, Robert Suer, Martin Staszko, Josh Brikis, ex-Team Full Tilt Pro member Jonathan Turner, Jaka, Dana Kellstrom, Burro Poker Team Pro Bolivar Palacios, PokerStars regular Anton Ionel and Alex Kostritsyn. Czech Republic star Staszko – as with fellow Team PokerStars Pro Heinz – has been hit hard after all five of his cash finishes at last summer’s WSOP also dropped into Period 2, meaning a hugely significant reduction in his points total. On a more positive note, San Francisco’s Galen Hall – last year’s PCA main event champ – showed the biggest rise, up 63 places, after finishing third in the PCA Super High Roller event for $470,400. The American also recorded a 64th place finish in the PCA main event, so expect him to move up again from his current position of 115th. The other big climbers are Brian Powell (up 50 places to 227th on 1,143.10 points), Dermot Blain (up 37 to 81st on 1,590.64), PokerStars players Andrey Zaichenko (up 31 to 243rd on 1,107.91) and Andras Kovacs (up 31 to 75th on 1,633.03), Team PokerStars Pro Vanessa Rousso (up 30 to 57th on 1,702.00), former Ultimate Bet Star Players Team member Mike Binger (up 27 to 217th on 1,158.56), Jesse Alexis Cohen (up 27 to 189th on 1,210.98) and Freddy Deeb (up 26 to 44th on 1,794.36). Uruguay’s Fabrizio Gonzalez, unfortunately, showed the biggest drop down the rankings, with the Montevideo native falling 95 places to 297th on 1,016.75 points. The South American’s 22nd in event #57, a $5,000 buy-in Pot-Limit Omaha Hi/Lo tournament back in early July, at the WSOP dropped into Period 2 to leave him with only one Period 1 result. Vegas-based Ben Lamb – last year’s WSOP Player of the Year – dropped 60 places to 105th on 1,466.25 points after his third place in the main event fell into Period 2, meaning he now has no scores in Period 1. Several other noteworthy players have dropped significantly, with Team PokerStars Pro Sebastian Ruthenberg falling 77 spots to 184th on 1,037.26 points and Mike Sowers (1,081.42 points) seeing his ranking drop 76 places to 258th. The other pros to suffer considerable drops include David Bach (down 76 places to 258th on 1,128.13 points), former Team Full Tilt Pros Erick Lindgren (down 61 to 288th on 1,033.82) and Peter Jetten (down 60 to 204th on 1,190.70), Nick Binger (down 54 to 195th on 1,207.02), PokerStars regular John Andress (down 53 to 292nd on 1,023.22) and ex-Team PokerStars Pro JP Kelly (down 53 to 142nd on 1,322.52). Don’t forget to check back here every week for the latest developments on the GPI.